Welcome to Bunny.nu » Blog Archive » When will Spring come? We are quite tired of the long winter now, and long for Spring to come. 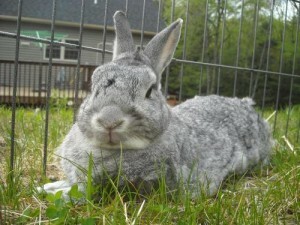 This picture from Daily Bunny shows Ash in the green grass. This entry was posted on Wednesday, March 20th, 2013 at 9:18 am	and is filed under Bunnies. You can follow any responses to this entry through the RSS 2.0 feed. You can leave a response, or trackback from your own site. Ash looks like he is really enjoying the green grass. It will be a long time yet before we see green grass here. Right now, it is supposed to be the first day of spring, but all I can see is snow on the ground and snow in the air and the temperature is freezing. We have had an unusually long winter, and there is a lot of snow and ice everywhere. I would like to have a green lawn like Ash has!